Today, Kim took me around to some of her favorite haunts. i.e. Pittsboro – a strange little somewhat macabre town, with a burned out courthouse, little shops – some with horrors, and a lovely little restaurant/deli, The General Store Cafe where we got beet salad and sweet tea, surrounded by interesting local art. Bought some goats’ milk soap from the young woman who made it from the milk of her own goats. Then we went to pick up Kim’s mom to take her out for a late afternoon dinner. She was sitting out front as if she was expecting us. “I was wondering if you were going to make it,” she said as we approached. We went in, briefly, so Kim could drop off some diet Dr. Pepper in her apartment and sign her out. We took her to the nearby Nantucket Grill. She ordered the top sirloin – Kim pointed to the picture on the menu and her mom said, “Oh yes. I want that.” Kim and I had salad. I watched in wonder as Kim and her mother would simply look at each other and burst into laughter, both for seemingly different reasons, or for no reason. I wondered how often she gets to have a good belly laugh in the home she lives in. She was having good belly laughs with us and I was concerned that she would inhale her food, she was laughing so hard. Her eyes would light up, she would look at Kim, they would make faces at each other and roar with laughter. None of our conversation made any sense to me. She noticed the handsome young man sitting in the corner of the restaurant, talking on his cell phone. “Are you paying attention?” she would ask Kim. Mothers never seem to outgrow that question do they? “No, Mom. I’m paying attention to you,” Kim would say. Last time I visited Kim, she and her mom lived in Florida. What was to be a fun holiday for Kim and me together turned into a hospital vigil while her mom had emergency by-pass surgery. Another time, after she pulled through that, Kim’s mom came back for a visit to her old neighborhood in Sonoma County. We spent some time together, without Kim around. She confided in me like I was her oldest friend. Today, as Kim says, her mother is five years old. 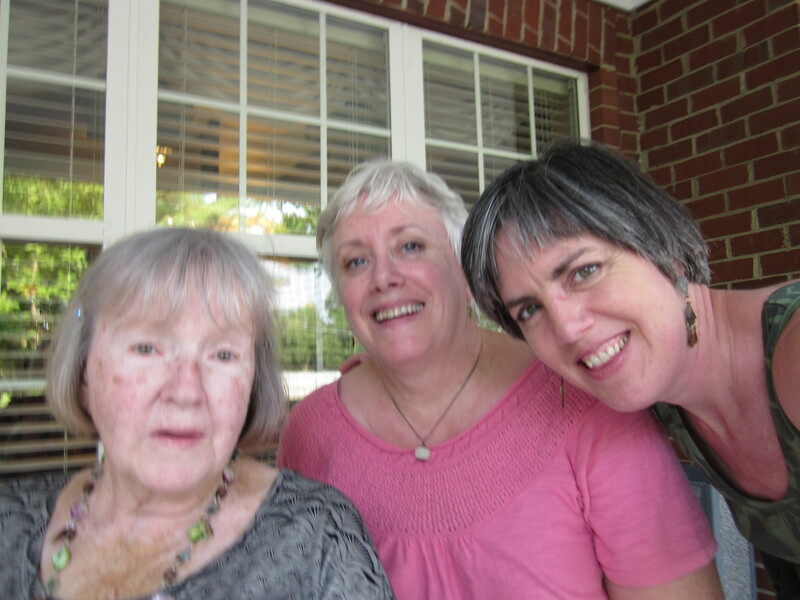 I watched my dear friend, who left her life in Sonoma County (I really mean to say, she left ME in Sonoma County… but I don’t want to sound so myopic and self-centered), to go be with her aging parents. Her father passed away soon after Kim moved, and Kim’s siblings are far away. Kim carries the full burden of her mother’s frailty and dementia. It feels crushing, yet…. They look at each other and laugh. And I laugh with them. I am enjoying reading this SO much! Thanks Hali. I’m so glad you’re joining in. How awesome. It sounds like a great day and like Kim hasn’t changed a bit! Big hugs to both of you. She hasn’t changed at all. Just picking up where we left off. I LOVE that! She still makes my heart laugh. Fawn… your writing is beautiful. Keep going. Thanks Ei. It’s your fault I started this thing to begin with.